The Kinden glass electric kettle is one of those kinds of kitchen appliances that will make your kitchen glow. Literally. And I will tell you in this review why this kettle can do that. If you are looking for a modern, sleek, beautiful kettle that works with any kitchen décor, you can stop right here. You have finally found it! I recently bought it for my own personal use after my boy, playing around, has broken our Cuisinart CPK-17 PerfecTemp, an outstanding kettle by the way. Having planned to write a review about this kettle, I already knew what to buy, so we decided to go with this one. The most important feature is that it’s made from borosilicate glass and 304 stainless steel and this feature make this kettle to be completely BPA free. 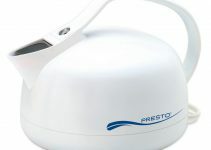 The control panel is situated on the base and is One-touch with LED indicators. It looks cool and it feels good when you set the temperatures. We love this feature. 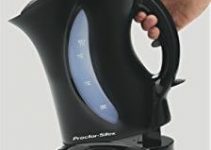 Another feature is the one I promised at the beginning of this review that this kettle can literally make your kitchen glow: It has a led light inside the carafe and every time you start the kettle a blue light is activated and turns off when the water reaches the set temperature. The kettle body is double-walled. It has a layer of plastic protective film to prevent easy breaking of the glass and maintains the heat better so that you can easily touch it while water is boiling. As every other product on the market, there are also a few cons. But before that, I want to make clear that the following deficiencies found with this reviewed kettle, may not be found with the one you buy. At full capacity, when the water reaches the boiling point, it boils for 30 sec more before it stops. Its a waste of energy that’s unnecessary. The lid does not close hermetically so the steam is released all around the lid. The scale filter does not close perfectly on the glass, so when you pour the water some flakes, if they exist, may slip in your tea. The scale filter is BPA free plastic (according to manufacturer) and when you pour, it touches the water. But I don’t know if this can be considered as cons. It is up to you to decide. We love this kettle! 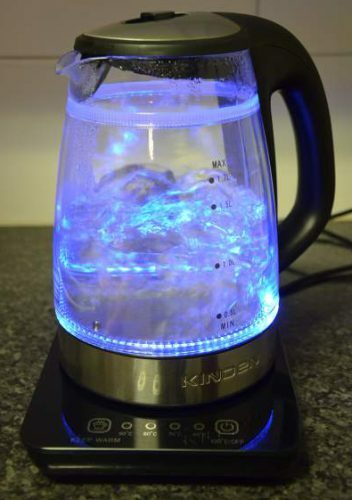 It’s very pretty during use thanks to the blue light and is fun to watch how the water boils. The price-quality-features ratio is very good, compared to other kettles on the market. The preset temperatures are a big help when you want your beverage such as oolong tea, matcha tea, green tea coffee or oatmeal perfectly made. It’s easy to clean. For tips on how to clean a kettle, read here. All being said, you will find in this product a real help and a nice looking tool which will be admired by your friends. Don’t forget to browse for other reviews too. Also, like and share.